There’s nothing like the satisfaction of slathering a layer of Homemade Strawberry Jam on a piece of buttered bread and taking a bite. Everyone loves a classic recipe. It never gets old and you can trust it to be there for you again and again. That’s exactly what this strawberry jam recipe is: a classic. Who can argue strawberry jam doesn’t go great with peanut butter on bread? Or how about slathered on a crisp piece of toast? I certainly can’t. You can buy a basic canning essentials set (like this one) for relatively cheap. 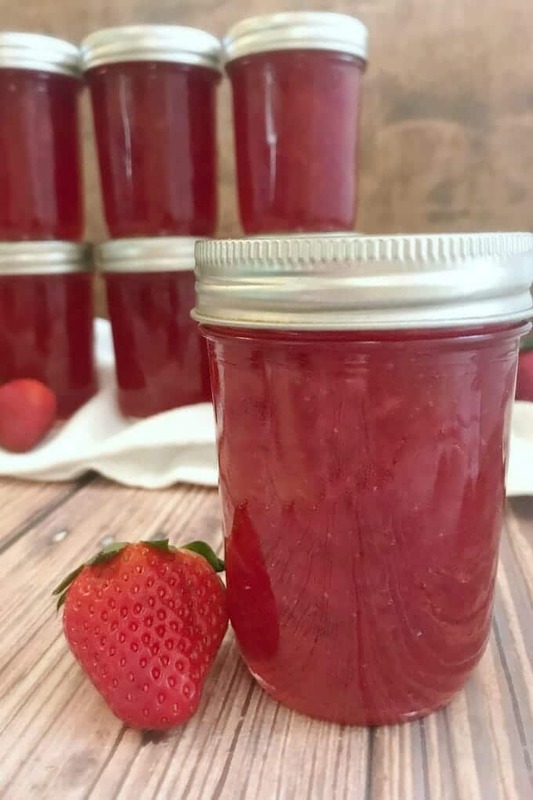 Once you’ve gathered all your canning equipment it’s time to start making some strawberry jam. Make sure all your jars, lids and bands are clean by washing them in hot, soapy water. Place the jars in a large pot filled with heated water. Place the lids in a separate pot filled with simmering water. Dry the bands and set them aside. If you have a canning pot, go ahead and use it. If you’re like me and don’t have one, simply use any large pot you have. Just make sure it’s about 3 inches taller than the jars you’re using to ensure they’ll be fully covered with water during the canning process. You also need to figure in some extra space because you need to put something between the bottom of the pan and your jars. I placed a small rack on the bottom of my pot so the jars wouldn’t sit directly on the bottom and would be heated evenly from all sides but some people fold up a tea towel and put that in the bottom of the pan. While your jars and lids are getting hot, make your jam. First, you’ll need to crush your strawberries. There are two methods you can choose between to crush/puree your strawberries, depending on your texture preference. 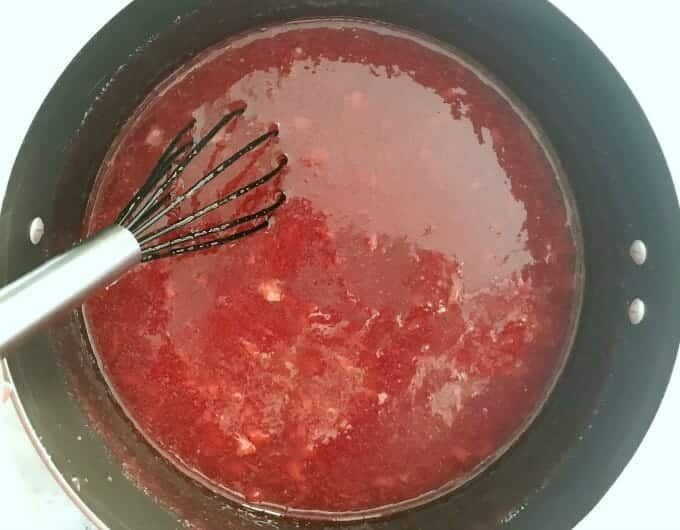 If you like some chunks of strawberries in your jam, place the strawberries in a flat-bottomed bowl or baking dish and mash them with a potato masher. If you prefer a smoother consistency of jam without chunks, place all the strawberries in a blender or food processor and puree them. Either way, you’ll end up with crushed strawberries ready for a jam session! (I couldn’t resist that food pun). 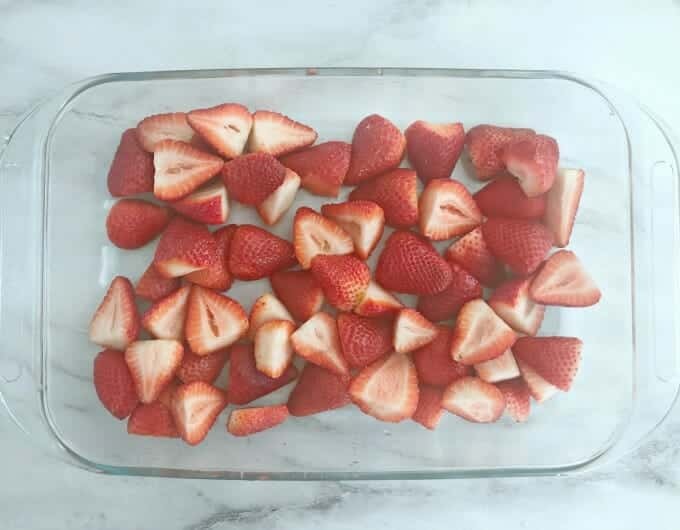 Transfer the strawberries to a large pot and start cooking. Add in the lemon juice, followed by the pectin, whisking until dissolved. Next, stir in the sugar and bring to a rolling boil. Continue stirring for 1 minute while boiling, then remove from heat. You’ll notice the jam has turned a deeper red color. Now you’re ready to start canning. Using a jar lifter, lift a hot jar out of the pot, drain the water and place on a towel or rack on top of the counter. Be sure not to place the hot jar directly on the countertop to prevent thermal shock and a big mess of broken glass. Fill the jars. Place a wide mouth funnel in the jar and ladle the jam in, leaving 1/2 inch headspace at the top of the jar. Remove air bubbles. Use a spoon or flat spatula and gently run it down the inside of the jar as shown above to remove any air bubbles in the jam. Clean the rim. 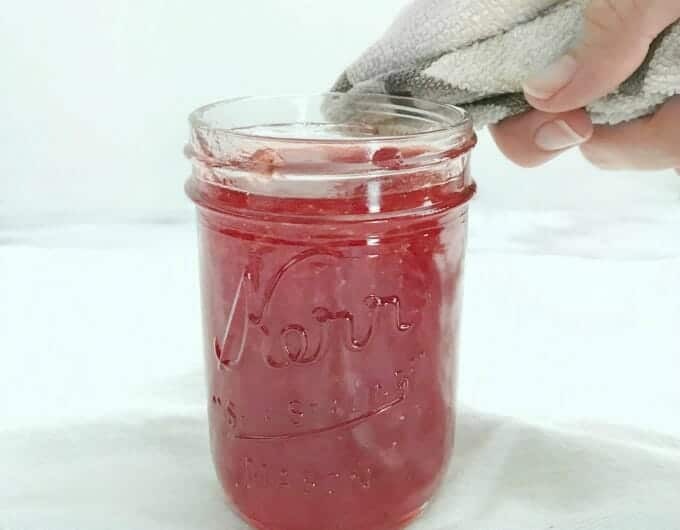 Wipe the rim of the jar with a damp rag or paper towel to remove any stickiness or jam that may impede a proper seal. Add a seal and ring. 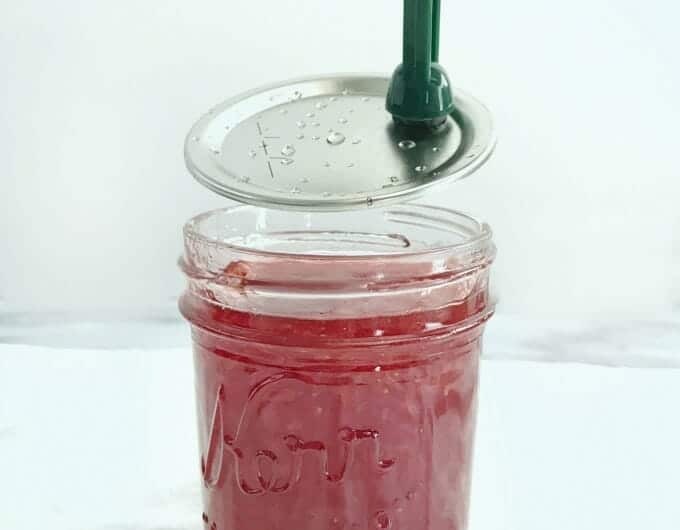 Retrieve a hot lid from the water (I used a magnetic lid lifter) and place on the jar then screw on a screw band until just tightened. 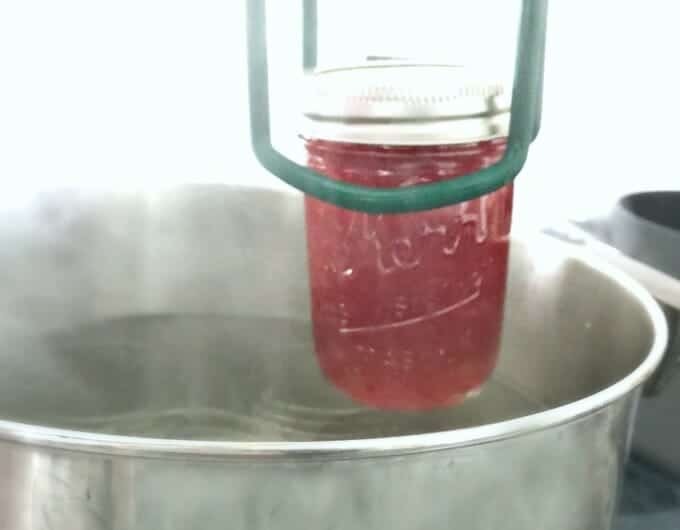 Do not tighten the band too much; the canning process requires some air to properly seal. Place the jar back into the pot and repeat until all the jars are filled and sitting happy in their hot water bath. Put the lid on the pot and bring to a boil. Once it reaches a boil, start a timer for 10 minutes, continuing a steady boil the whole time. After processing, turn off the heat and remove the lid and allow to cool for 5 minutes. Finish by removing all the jars from the pot and placing on a clean towel or rack on the countertop. Do not tilt the jars or wipe the water from the lids. You don’t want to risk agitating the lid and preventing sealing. A proper seal is essential to prevent spoilage during storage. Leave undisturbed on the counter for 12 to 24 hours. After 12 to 24 hours, check on your jam to see if the lids have sealed. Remove the screw bands and check the lids for a good seal by making sure the center of each is indented – do not push down on the center as you may force a seal but not realize it. If the center is pulled down and does not pop up, the lid is sealed. You can also check by slightly trying to pull the edge of the lid up (do not pull all the way). If it resists being pulled, the seal is set. 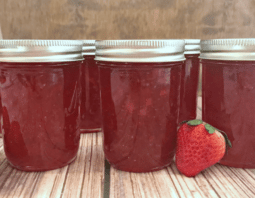 Congratulations, you just made a batch of classic strawberry jam! Give yourself a pat on the back and grab some bread and peanut butter out of the pantry. A moment as great as this must be celebrated. Wash seven half-pint jars, lids and screw bands with hot soapy water. Dry screw bands, and set aside. Place jars in a large pot and cover with water. Bring to a simmer. Put lids in a separate medium pot of hot water. Leave jars and lids in water until ready to fill. 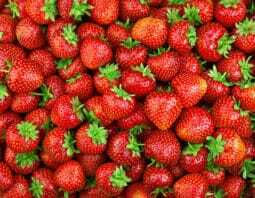 Wash and hull strawberries and place in a flat-bottomed bowl or baking dish. Mash strawberries using a potato masher until they have reached your desired consistency. 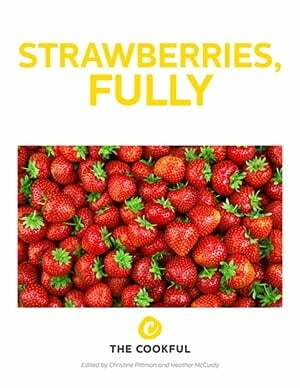 Alternately, you may puree the strawberries in a blender for a finer consistency. 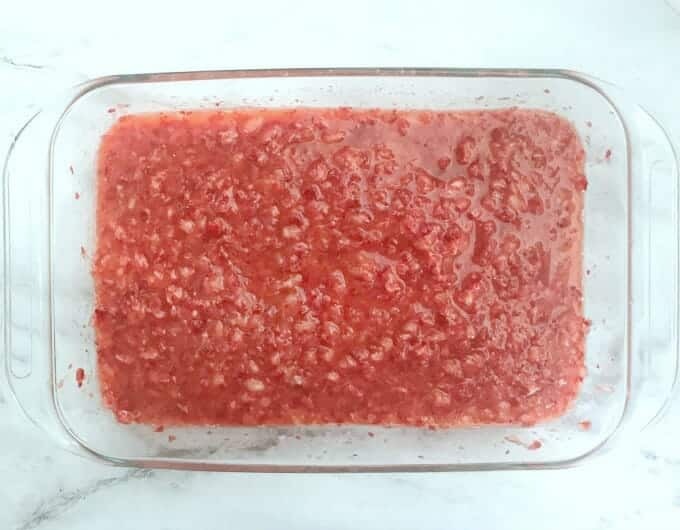 Transfer crushed/pureed strawberries to a large saucepan. Add lemon juice to strawberries. Whisk in the fruit pectin until dissolved. Over high heat, stirring frequently, bring to a rolling boil. Stir in sugar and, stirring constantly, return to a full rolling boil. Continue rolling boil, stirring constantly, for 1 minute. Remove from heat and skim off any foam from the top*. One at a time, lift a jar out of hot water, draining water back into pot. Place on tray or dry towel. 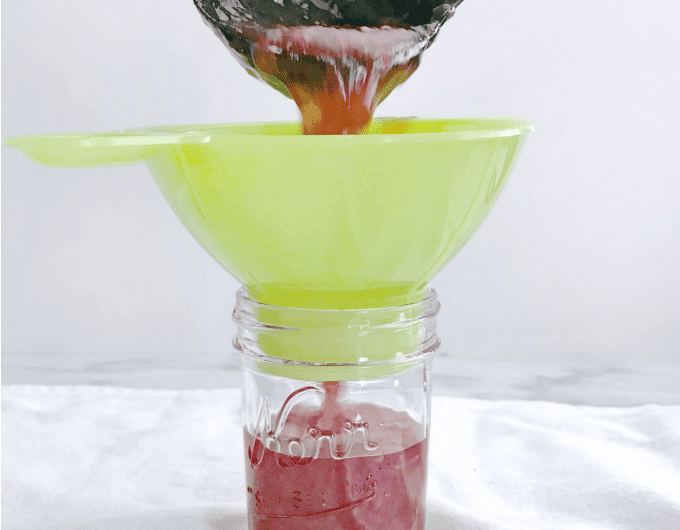 Ladle hot jam into hot jar using a wide-mouth funnel, leaving 1⁄2-inch headspace at the top. 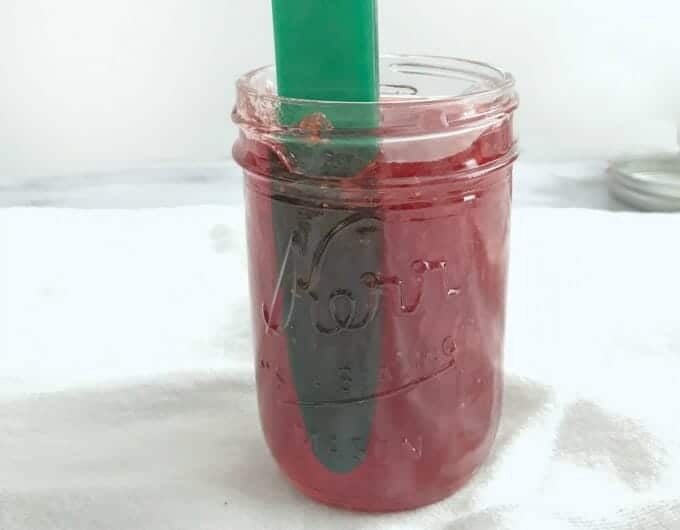 Run a rubber spatula or chopstick (do not use metallic utensil) between the jam and the wall of the jar to release any trapped air bubbles. Wipe jar rim and threads with a clean, damp cloth. Carefully remove lid from hot water. Place lid on jar and screw band down evenly and firmly, until just tight (do not over-tighten). Return jar to pot and repeat until all jam is used. 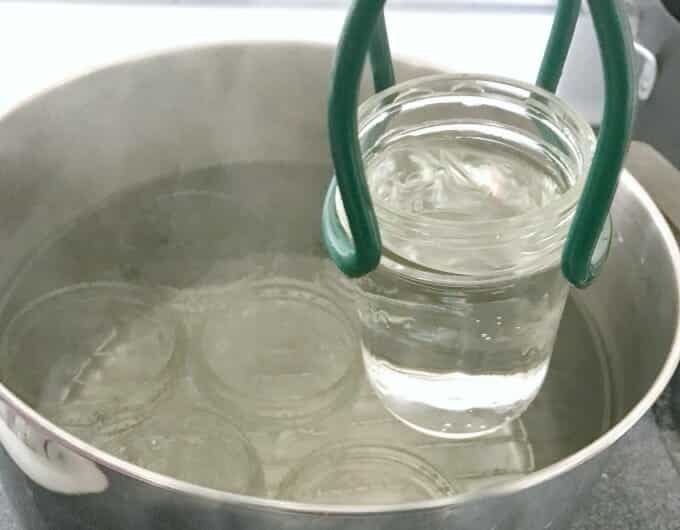 Make sure there is at least 1 inch of water covering the top of the jars. If there isn't, add more hot water. Place lid on pot. Over high heat, bring water to a rolling boil. After reaching a rolling boil, start timer. Process jars for 10 minutes at a steady rolling boil (if you are at an altitude above 6,000 feet process for 5 minutes longer). Turn off heat and remove lid from pot. 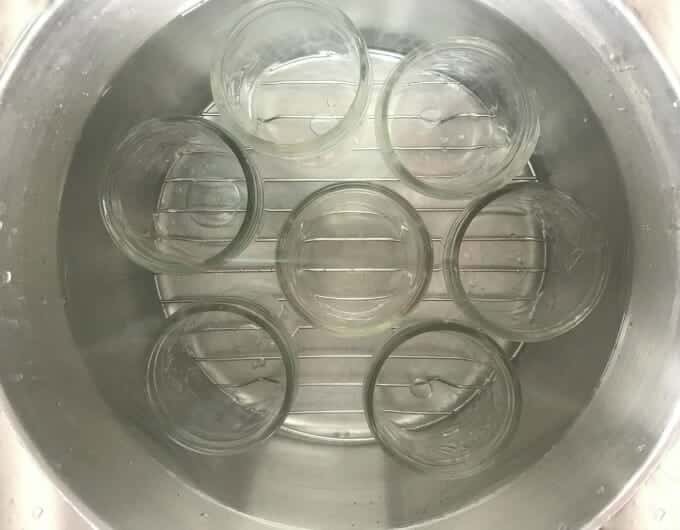 Allow to cool for 5 minutes, then carefully remove jars without tilting them and set upright on a dry towel, cooling rack or wooden cutting board (do not place directly on counter top to prevent thermal shock). Do not retighten bands or dry lids. Let jars sit undisturbed to cool and seal for 12 to 24 hours. After 12 to 24 hours, remove the screw bands and check the lids for a good seal by pressing down on center of each. If center is pulled down and does not pop when pressed down, the lid is sealed. You can also check by slightly trying to pull the edge of the lid up (do not pull all the way). If it resists being pulled, the seal is set. Rinse the screw bands and wipe lid and jar surface with a clean, damp cloth to remove any food debris or If desired, you can loosely reapply dry screw bands back on. Label and date lids. Store jars in a cool, dry, dark place. For best quality, use within 1 year. 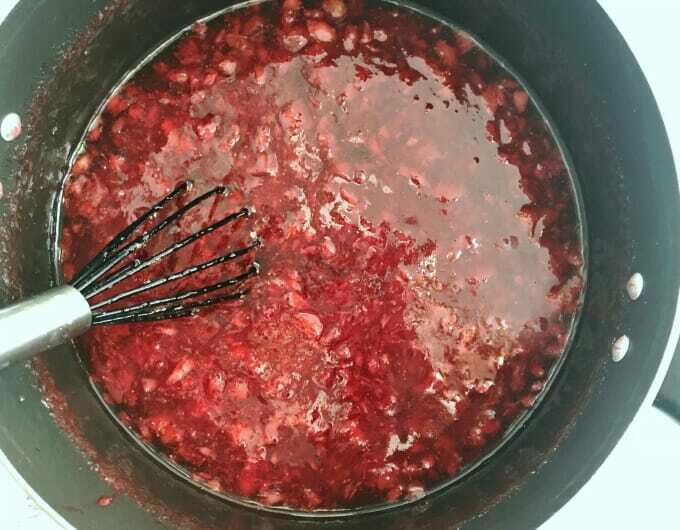 *Tip: To prevent jam from foaming you can add 1/2 teaspoon butter to jam mixture before cooking.